In 2012, Oxford Economics conducted a study about the talent areas in high demand over the next decade. 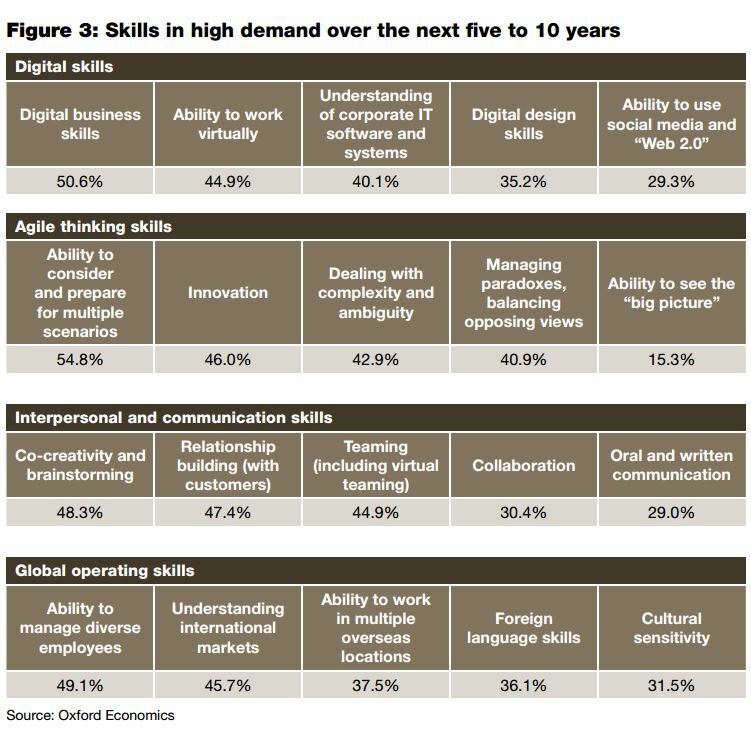 Global Talent 2021, which drew on a global survey of over 350 HR executives and secondary data from the public and private sectors, found that digital knowledge, agile thinking, interpersonal and communication skills, and global operating capabilities will be some of the areas in highest demand. Workforce 2020 will revisit some of Global Talent 2021’s ideas, identifying the skills that are most important to employers today. Will the need for new digital skills make more traditional skills obsolete? Will the necessity of “soft” skills like creativity and ability to work well with others endure? Most importantly, what actions are employers taking to develop these capabilities within their organizations, if any? We are excited to answer these questions and others when our survey closes next month. In the meantime, you can download Global Talent 2021 here. This entry was posted in Research and Reports and tagged Skills by Adrianna Gregory. Bookmark the permalink.